On Tuesday 20th of January I left from Larisa to Athens international airport. Planters' strikes closed the highway to Athens so I passed almost through the half Greek villages to reach the airport in Athens. I flew with Easyjet and arrived to Milano late at night. It was very cold in Milano but unfortunately I had to stay a few hours outside the railway station there. I took the first train in the morning to go to Aosta. Aosta is an Italian city into the Alps very close to Switzerland. Dimitris picked me up by car and we drove back to Switzerland in a small village called Les Maricottes. In order to drive from Italy to Switzerland you have to pass from Saint Bernard pass and in winter time you have to cross the large tunnel. Les Maricottes is a small village witch is located near Martigny city. 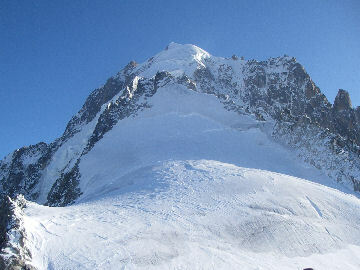 Next day 22/01 we started early in the morning to attempt the mountain Dent du Midi 3200m. We had to use snowracettes because of the fact that there where a lot of snow. We reached the summer village Van d'en Bas 1300m and also the last village Van d'en Haute 1400m. We tried to climb higher but even with the snow racettes we drop 50 cm into the snow. At about 1540 meters altitude we stopped and turned back to village. 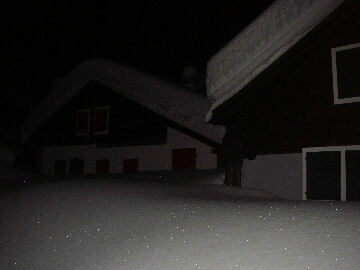 Next days it was snowing a lot in the area, the snow was almost 1 meter high. Thus, we did some tour trip to Chamonix (France) and also to Lausanne and to Montrex. Moreover we visitted Grimentz in Valais valley. There I walked many kilometres with the snow raccettes into the surrounding paths. Only a few days left before my return back to Greece, weather was getting better so we choosed to climb a high peak. Without a lot preparation we decided to climb the north face of Aiguille Verte a peak with 4122 meters altitude in Argentiere (France). We had only 3 days before my flight back to Greece so we had to do it fast. We took the train from Les Marecottes to Argentiere and after that with tele cabin Grands Montets we arrived on the summit Aiguille des Grands Montets at 3290 meters. 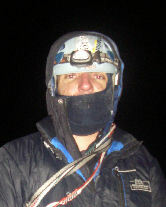 Due to the last snow falls we decided to climb at night and come back next day. Our ascent route was Couloir Couturier. At 13:00 without equipment we traversed the north slopes of the mountain and we reached the base of the north slope (route). We did it in order to find the route and see the route conditions and also it would be easier for us to find the route at night. 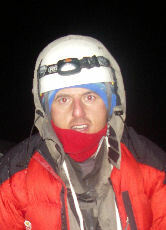 Later we returned back to the teleferik base and we prepared hot water and tea for our ascent. It was dark at 19:00 when we left from teleferik base. Unfortunately, it was a night without moon, and we could not see far. Dimitris first crossed the rimme but the first part of the slope was not easy to pass. Snow was partly soft and some time ice. The only way to climb fast was to climb in parallel. For many hours without breaks we were climbing into the dark. The steepness of the slope was not exceeding the 60 degrees but was always more than 45 degrees. Couloir was 1000 meters vertical height, and we did not find not even one horizontal step to rest our feet. We did only two belays during the whole route and took us 8 hours to reach the summit of Verte at 4122 meters where we arrived at 4:30 in the morning. Reaching the summit the fatigue disappeared. We were feeling so happy that we reached the summit in winter period so we couldn't even think the danger that was waiting for us. Our route back was couloir Whymper which is the normal route of the peak. Because of the darkness we had to wait on summit until 7:00 in the morning, thus we made a hole into the snow to be covered from the wind just 1 meter lower of the summit. Temperature was -21 C and had almost no wind. We got really cold, I couldn't feel my hands and feet. When the sky got red in backside of Mont Blanc we took the route back. Before we even made 10 meters we realized that it was impossible to cross the ridge which is guiding to couloir Whymper (ridge towards to Droite). "It is impossible to continue" Dimitris shout. As there was no other way, we slowly started to climb on the ridge. Ridge was like a knife and about 200 meters long with a huge cornice. It took us two hours to cross this 200 meters of the ridge, similar we had never done in past. Sun was high when we started to do the descent rappels in couloir Whymper where the snow was in not good condition. We made more than 10 rappels into the gully and after that we continued to descent without rope. In the lower part near the glacier we did 3 more rappels. At the last one, we had to pass a huge crevasse. While I was trying to pass this huge crevasse, the bridge over the next one broke and I had a fall into the crevasse. I got out and jumped to the other side. We finally reached a more flat place! While we started feeling better, a huge glacier with hundreds of covered crevasses was waiting for us. We still had many difficulties in order to get the train to Chamonix, Glacier de Talefre. As we walked on the hard snow the top level of it broke so we fall into the snow up to our knee. We had to do about 10 kilometers without stops, food and water to reach Mer de Glace. We could see the teleferic from far a way but we felt as we would never reach it. We lost our last energy. Sun was already hiding behind the mountains.The last train to Chamonix would leave at 16:30. We walked as fast as we could and finally arrived in teleferic just two seconds before its departure. Finally everything went ok, otherwise we would have to do a second bivouac without food and water. By train we return back to Chamonix. Due to a discordance between France and Swiss trains and a strike, we arrived in the border and no train to Switzerland was waiting for us. After many discussions, a taxi picked up us to Martigny, and we escaped from the second bivouac for a second time. Our adventure finished at midnight when we arrived at home. Even though the night sleep was not enough, next morning I had to prepare my luggage and travel to Milano. I took a Swiss bus up to Sant Bernard pass and continued with an Italian one until Aosta. By train I travelled to Milano and at midnight I was in Malpensa airport. Next morning I departed to my country where Louiza and Labros were waiting for me at the airport. A short stop in Athens and then by car I arrived to my village.